The EPK was first avaialble from the official site, but a special promotional DVD was prepared by Decca when the album was going to be released in the USA. Extremely rare, this was a custom made DVD with printed label in a DVD box with front and back covers. Hot on the heels of their 30th Anniversary Celebration Tour that saw them playing to over a quarter of a million people during their sold out 2008 European/UK arena tour, and their performance at Nelson Mandela�s 90th Birthday concert in London�s Hyde Park, Simple Minds are about to enter the most prolific period within their extensive career with the highly anticipated brand new album Graffiti Soul. 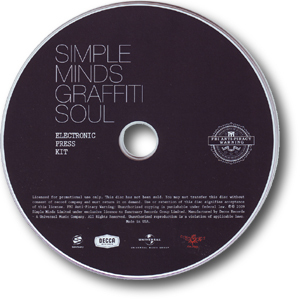 Their 15th studio album, Graffiti Soul was initially written on location in Rome, Sicily, Antwerp and Glasgow. Simple Minds then returned for the first time in almost three decades to the famous Rockfield Studios where the Scottish group originally recorded their earlier seminal albums Real To Real Cacophony, Empires And Dance and sowed the seeds of New Gold Dream. Produced by Jez Coad and Simple Minds, the new album was mixed in Los Angeles by the legendary Bob Clearmountain, who previously mixed Simple Minds' multi platinum Once Upon a Time album, and who�s mixing credentials include Bruce Springsteen�s Born In The USA , David Bowie�s Let�s Dance , and Roxy Music�s Avalon . "Graffiti Soul is a bold and energetic collection of songs, and we could not be happier with the result,� says lead singer, Jim Kerr. �Stylistically, this is a truly vibrant rock�n�roll album that�s bursting at the seams with quite possibly the most ballsy pop songs we have written in years." 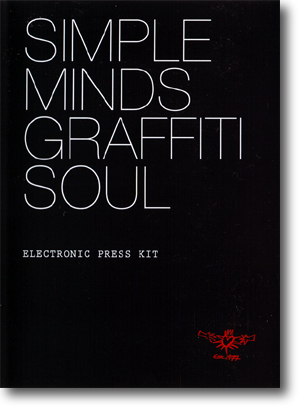 Although the heart and soul of Graffiti Soul is contemporary in sound, the feel of classic Minds is evident, although the spirit of some of Simple Minds� original contemporaries such as Joy Division, Magazine and the Stranglers, are not far away. Continues Kerr, "It�s taken us a while, but over the last couple of years Charlie Burchill and I have put together a great team of individuals to work with, and that, as well as a revitalised and energetic new commitment has triggered an effect that has dramatically overhauled Simple Minds. Graffiti Soul is testament to that." In addition to the launch of the new album, Simple Minds are in the process of confirming an extensive Graffiti Soul World Tour that will encompass a lot of songs from the new album, plus the band�s best loved classics including Alive and Kicking, Sanctify Yourself, Waterfront, Promised You A Miracle and Don�t You (Forget About Me).